The volcanic origins of the island of Ischia is now one of the most popular and most natural thermal water destinations in the world. The combination of underground hot water, enriched with highly effective mineral salts with a fascinating natural scenery is certainly unique in the world. Therapeutic efficacy and healing power of the numerous hot springs was discovered 2,000 years ago and appreciated. 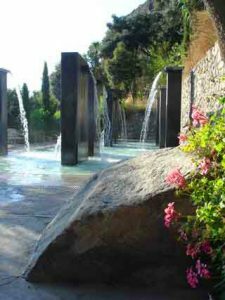 On the island there are numerous springs with temperatures between 20 and 100 degrees with strongly fluctuating radioactivity (radon) and its successful cures for rheumatism, arthritis, sciatica, neurological and gynecological disorders, joint pain, etc. 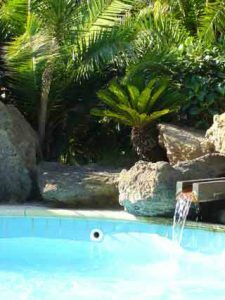 Directly in Sant’Angelo, the thermal conditioning / spa “Tropical”, a true oasis of well-being, tranquility, health and relaxation, nudist terrace is available. Reduction on admission for residents. Recommended are mud and subsequent massage. The mud is a special mixture of earthly substances, it is applied as required and the doctor’s recommendation from cold to hot in partial or full packs. A special feature of SANT ‘ANGELO are the “fumaroles” the hot sand on the beach. Instead of hot water as the source of the hot steam comes here through countless tiny needles to the surface. Recommended the hot sand baths are open-air, there are at the beach experienced workers available who speak the Eingrabetechnik. Apart from the amazing healing successes in the hot sand, there is a special fun here in 20 centimeters deep to boil potatoes or eggs without water in few minutes. Not to mention countless saunas in natural and artificial caves with temperatures up to 100 degrees. Particularly appreciated by the Romans, the “Cava Scura” was. Coastal areas on the south side of the island that were still available 2000 years ago and had hot springs, today lie below sea level. There, some overturned, carved out of tufa throughout bathtubs can be found in some places in small coves, from antiquity. The hot springs are still being felt in these places on the ocean floor. In the “Bay of Sorgeto” bathing is possible throughout the year, since thermal springs gush directly into the sea. On the island there are other thermal baths, which we will gladly inform you on the spot.